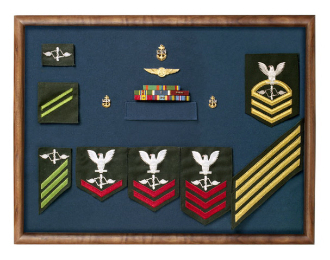 This Award Frame provides a fantastic way to display all of your medals, patches, rank insignia, pins and more. This beautiful case is hand crafted from solid oak and features a pocket from the dress uniform made from the material of an actual service uniform fabric. This case is also available with a velvet background. 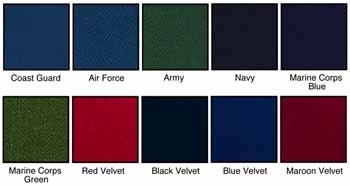 See below for colors available. You may also add an engraving plate that you may mount wherever you like on the case. Also Included with this case are a wall hanging kit and complete care instructions. *Please note that if you choose the Coast Guard Fabric or any of the velvet fabrics for this Award Frame it will not include the pocket in the center.